Through a veil of blue mist. . .
Morrigan Press Inc. is pleased to announce that it has acquired the license to the unparalleled roleplaying game setting of Talislanta. Taking over from Shooting Iron Design, Morrigan Press strives to take the exciting and unique world of Talislanta to another level, and build on the cult status that it currently enjoys among gamers. The Talislanta game was originally created by renowned game designer Stephan Michael Sechi in the 1980's. In the intervening years, Talislanta was further developed by Wizards of the Coast (Jonathan Tweet) and Shooting Iron Designs (John Harper). Continuing this evolution, Morrigan Press is confident that a whole new generation of gamers is ready to experience this unique world from a freshly creative perspective. Scott Agnew, Morrigan's founder and president had this to say: "As a long time Talislanta fan myself, I am very excited about this license acquisition. Talislanta is one of the most complex, unique and exciting settings in the industry and we look forward to bringing it to a whole new generation. We will also be maintaining support for the existing Talislanta material in print so fans of the current game need not worry: the game they know and love is not going anywhere." With this new acquisition, Morrigan adds to its' already diverse and exciting line of products. Morrigan Press Inc. currently designs and develops the Jeremiah Roleplaying Game based on the critically acclaimed television series by J. Michael Straczynski, the same person behind the Babylon 5 phenomenon. Jeremiah is being published by Mongoose Publishing, one of the most respected names in the RPG industry. Morrigan Press also publishes an Organized Crime line of sourcebooks for the d20 Modern system, has a licensed sci-fi game in development from Platinum Studios and is working with the Horror Writers Association on a line of horror RPGs. In addition, two in- house games are currently slated for release in early 2005: an historical fantasy game entitled High Medieval and the dark, modern supernatural game, Lazarus Effect. "First of all, I'd like to thank John Harper and Jonathan Elliot of Shooting Iron for the great work that they did on the Talislanta 4th Edition and the Talislanta.com website. They did an awful lot to help promote and support Talislanta, and they've also helped make the transition to Morrigan Press a smooth one. Thanks to them, "the Rasputin of RPGs" lives on. I think the Morrigan Press deal will be terrific for Talislanta fans, or I wouldn't have agreed to do it. Scott's a Talislanta fan from way back, and I think the game will be in good hands with him and his team. I look forward to seeing what Morrigan will do with the next incarnation of the Talislanta RPG." First of all, we are ecstatic to be taking over Talislanta. The SI guys have done a great job with 4th edition and we look forward to continuing on in their footsteps. Morrigan Press Inc is incorporated in New Brunswick, Canada and publishes multiple lines of roleplaying games for the Adventure Game market. Their first foray into the wild and chaotic roleplaying marketplace was with the Jeremiah Roleplaying game based on the popular television series of the same name. Morrigan has since secured other licenses as well as developing game lines of their own creation. Yes, indeed. The printing for MR is complete, and now it's just a matter of receiving the books and shipping them out to all of you who pre-ordered. And if you haven't already ordered a copy, we suggest you hurry down to your local game store and do so. Clay Van Sickle was a great guy, and decided to make a Talislanta map using Campaign Cartographer. You can see a jpg version of it, or just download the CC file (1.1 MB). You'll need the CC viewer to look at the file, and it's available for free from Profantasy (sorry Mac and Unix users, it's only for Windows). It's highly worth it. You can zoom in and out, print at good resolution, and it's in color! Just recently it struck me on how to make the Tal map into a PDF, and not have it be 15MB in size, so that's exactly what I did, and now you too can download it. 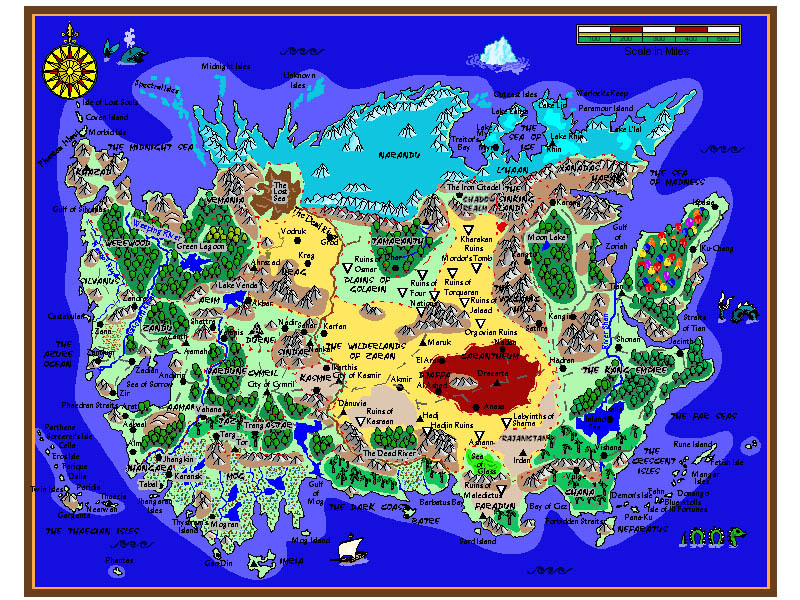 Weighing in at only 1.9MB, here's the One-page Talislanta Map from the back of the Tal4 book. Finally! I know you've all been waiting for it for a while, but now the wait is over. It's actually a bit bigger than I wanted it to be (just over 1MB), but it prints out just as nicely as the one in the back of the book, and you don't have to dea with trying to get your book to lay flat on the photocopier. Download it now from the Character Sheets page. Since there are a lot of questions that get asked frequently, we decided to post the F.A.Q. list that's been circulating on the email list lately. Hopefully it will answer YOUR question. Even we make mistakes, so we figured that the least we could do was let you know what and where they were in the book. So, feel free to check out the Errata page. It'll most likely be a growing thing as more are found. Dave Vershaw sent in a set of house rules to determine hit location, and how to modify the damage taken accordingly. He also deals with height of the target and attacker, and a rule about skill penalties for hit point loss. Betcha never gave much thought to candles in Talislanta before did ya? Well now there's a whole bunch of nifty ideas for you to use on the Chandlery page of the Equipment section. Once you've seen 'em, you'll never use a plain old candle again. Originally, there was an introductory adventure included with Tal4, but due to space restrictions it was cut. Now you can just pretend that the reference to it in the book really references The Puzzle Box online. Of course, you'd have to have an online connection... never mind. So, for those of you wondering if there was ever going to be anything more to the gallery than just the 3 P.D. pics that were there (and very lamely duplicated from the tour I might add), you should be pleased to note that there has indeed been more content added. New artists too! Check 'em out. All of Colin's weapons, armor, and instruments have been updated, and now that Tal 4 is out, when better a time to check 'em out to see if there's anything you might want for your character. Also, his selection of new skills has been updated. The new talislanta.com site goes online. Champagne and little cheesy snacks were served at the opening party, but everyone snubbed them and went straight for the case of Newcastle Colin brought.